One of the most painstaking parts of planning a wedding is selecting the perfect rings to represent your everlasting love. With great care and attention to detail, couples devote hours to considering the carat, clarity, cut and cost of the precious stones that they plan to purchase. 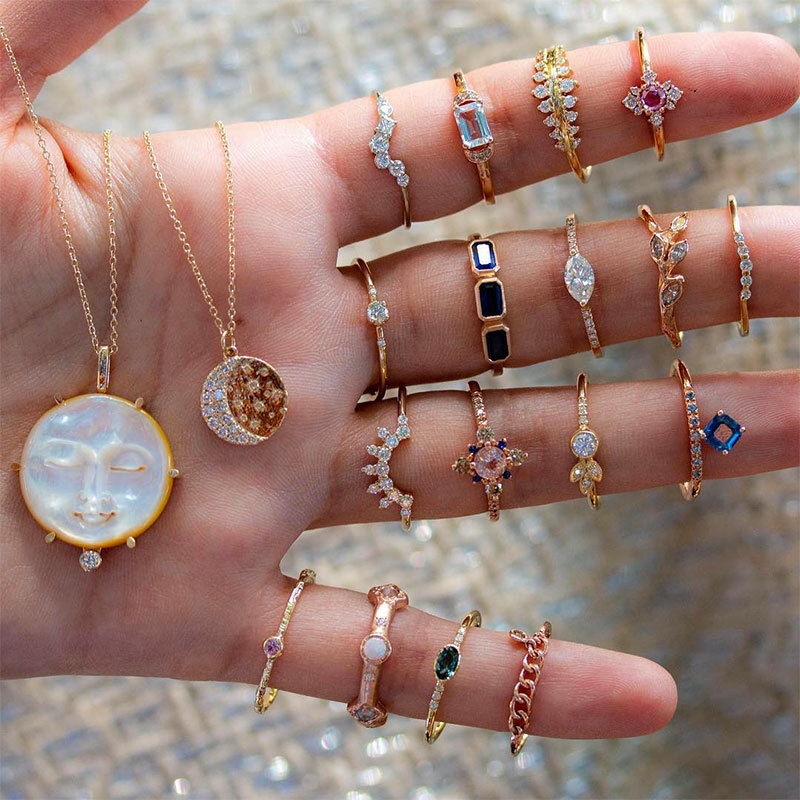 While sapphires, rubies, and emeralds are popular throughout much of the world, where diamonds have either been too expensive or too extravagant for mass cultural consumption, an estimated 70 percent of American brides opt to sport a diamond on the fourth finger of their right hand. Known as the King of Stones, some cultures believe the diamond is created from the flames of love. Considered the quintessential love stone by the majority of modern brides in the U.S. and the U.K., adding the sparkly diamond to a wedding ring setting is a relatively recent phenomenon considering the gem’s 4,000-year history. The fascination with diamonds dates back to the earliest civilizations when people believed the rare jewel was fragments of falling stars and teardrops of the gods. Legends hailing from the ancient Indian Hindus, Greeks, Romans, Hebrews, and medieval Italians told of the diamond’s ability to reflect the eternal flame of true love. A symbol of strength, the world’s most durable stone adorned armor, shields, and swords of European monarchs and knights from England to France to Hungary. Imported from mining camps in India, the love affair with the King of Stones flourished among wealthy European aristocrats in the late 15th century. Set in either gold or silver, diamond-studded betrothal rings gained popularity in Venice, Austria and the U.K. Known as scribbling rings in England; lovers used diamonds to engrave messages and poetry on window panes, a flirtatious practice that even the future Queen Elizabeth I reportedly engaged in. The discovery of African diamond mines in 1870, combined with the rapidly increasing wealth of the Industrial Revolution, made the noble jewel more accessible to the masses. 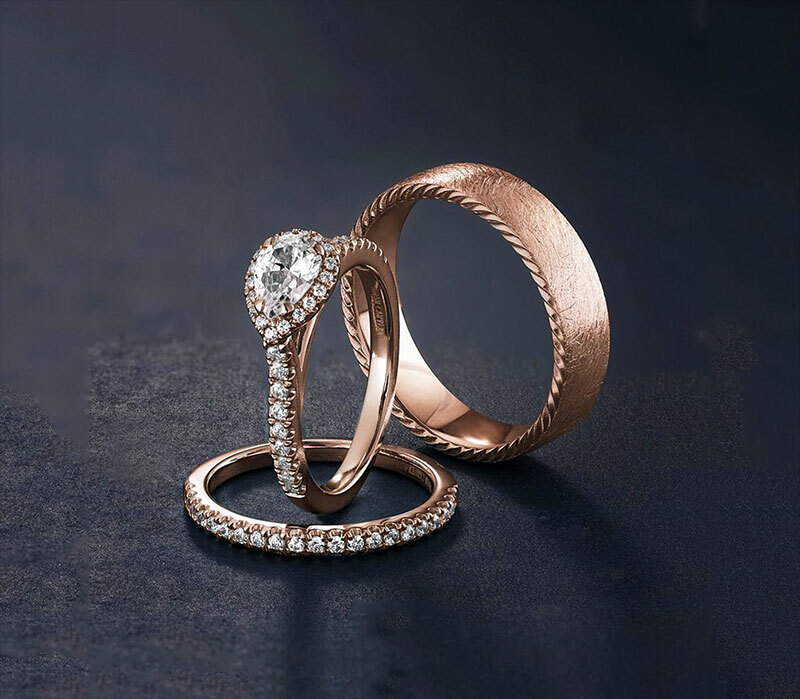 Set in rose or yellow gold, Victorian wedding rings typically featured rows of diamonds in a bezel setting accented with a bottom mine cut diamond. In 1886, the six prong, Tiffany cut solitaire was introduced as an engagement ring in America, and today it is one of the most iconic symbols of love. As the hardest natural stone, the earth produces, the diamond is a fitting metaphor for love’s ability to survive everything. Italians believed Cupid carried diamond-tip arrows to instill unity, faithfulness, clarity, and endurance into each relationship he created. Diamonds are also said to emit an energy that wraps the relationship in trust and binds the soul to the promised vows. Ancient Jewish rabbis believed that the brilliant sparkle of a diamond would lose its luster in the hands of an untruthful person. Diamonds have also been an important ingredient in many healers’ handbag of tricks for centuries. Considered to possess powerful protective and healing properties, the stone has been used to cure an array of heart and head ailments, including depression, nightmares, physical tiredness and disturbances in the aura. According to Rodika Tchi, About.com’s Guide to Feng Shui, a solitaire diamond has the best energy because it represents the unity of the couple and possesses more power than a grouping of smaller, weaker stones. You can harness this energy by adding one small stone on either side of one larger stone. Three similar-sized diamonds, side by side, can invite trouble into the relationship. Diamonds naturally form in a wide variety of colors, although they are available at a significantly higher price. The pink diamond, which represents creativity and romance, is among the most requested, but blue is believed to provoke jealousy in the wearer. Yellow diamonds encourage deep friendship and happiness while brown diamonds symbolize harmony and tradition. However, gemstones that undergo color treatments are believed to lose their inherent powers.